This post contains sponsored links from www.runNOTC.org. Richard Newcomb Memorial Father's Day Race 2016 annually takes place in New Orleans, Louisiana - USA. Sunday, June 19th The New Orleans Track Club will present the annual Father’s Day Race in Audubon Park. It is a family-friendly event celebrating fathers and father-figures. 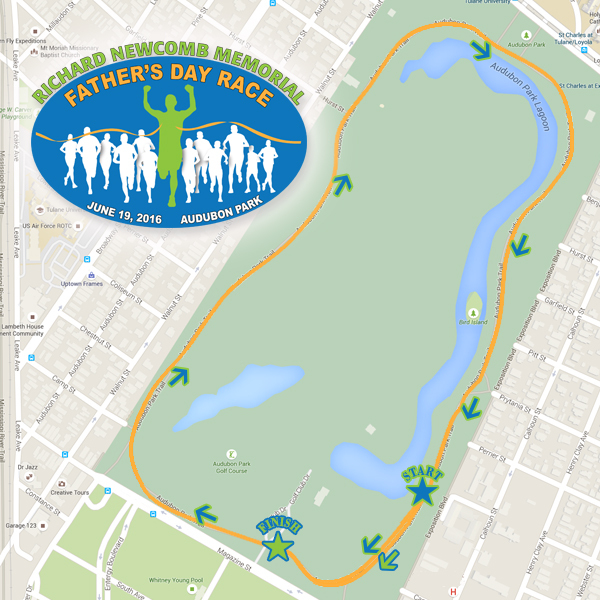 The Father’s Day Race will take place at 8:00 a.m. starting and finishing near the Magazine Street entrance to Audubon Park in uptown New Orleans. Participants will enjoy a 2 mile or half-mile course that follows the Audubon Park running and walking course, benefiting from the shade of the historic oaks alongside the scenic path. Runners and walkers of all speeds and skill levels are encouraged to participate. In addition, the morning’s festivities will feature a competition that pairs fathers and grandfathers with their children and grandchildren for special awards. Both the 2 mile and half-mile events will be followed by a post-race festival featuring music, food, award presentations, and more.